Doctor Fenkenstrain needs a servant to run a dark errand for his latest experiment. Are you willing to help Fenkenstrain with his work? Begin by reading the signpost near the Hair of the Dog Tavern in Canifis. 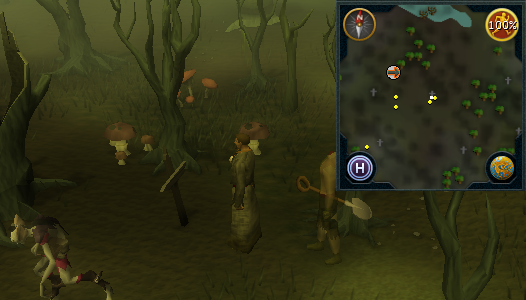 First off, read the signpost near the Hair of the Dog Tavern located in Canifis, which happens to be advertising a job. Now head along the road northeast of town until you find a large castle. Speak to Dr. Fenkenstrain and ask him what job he's asking about. Describe yourself as 'braindead,' and that your greatest skill is 'grave-digging.' He will say that you need to find four dead body parts, including a pair of arms and legs, a torso and a head. Now speak to the Gardener Ghost in the room to the north, with your Amulet of Ghostspeak on and ask him about his head. He says that it was chopped off, and he will eventually follow you into the woods to show you where it happened. Leave the castle and head south, past the dead trees, and then head southeast into the Haunted Woods until you reach Ed Lestwit's grave marker. You'll find various creatures here, including level 88 Vampyres, and level 84 Leeches. You can also speak to the ghost to see which way to walk. When you find the grave, just Dig with your Spade until you find a Decapitated Head. Now travel to the Hair of the Dog Tavern in Canifis. Talk to Roavar and ask for something to eat. Buy the Pickled Brain for 50gp (or cast Telekinetic Grab on the Pickled Brain on the nearby table), and use it with the Decapitated Head. Head back to the castle and go up the northwest staircase. Inside the nearby room is a Bookcase, which you can search for "The Joy of Gravedigging" to get a Marble Amulet. On the east side of this floor is another Bookcase, which you can search for "Handy Maggot Avoidance Techniques" to obtain an Obsidian Amulet. Use the 2 pieces together to form a Star Amulet. Now leave the castle again, but this time follow the path to a small graveyard to the southeast. Use the Star Amulet with the Memorial to the far east, and then Push it to find a crypt. Follow along the path into a room of Experiments, and kill the level 50 Experiment that appears to be both Wolf and Human. Pick up the Cavern Key that it drops and continue northwest along the twisty path until you come across a gate. Unlock it with the key and head up the ladder, to find yourself on a small island with 3 memorials to the north. Dig in front of each of them to receive a pair of Legs, Arms, and a Torso. Push the Memorial to the south and make your way back through the cavern. Bring all of the body parts back to Dr. Fenkenstrain, who now needs a Needle and 5 Thread to sew the parts together. After he sews the body up, he determines that he needs lightning to bring it to life. Talk to the Gardener Ghost again, and ask him about the Key to the Shed, which he gladly gives to you. Search the nearby Pile of Canes for 3 Garden Canes, and then search the Cupboard in the small room for a Garden Brush. Use each of the canes with the brush (with 3 Bronze Wires in your Backpack) to make an Extended Brush. Head upstairs, and use the brush with the Fireplace in the small room to the west where you found the Marble Amulet. You'll get a Conductor Mould, which can be used to make a Conductor by using a Silver Bar with a Furnace with the mould in your backpack. 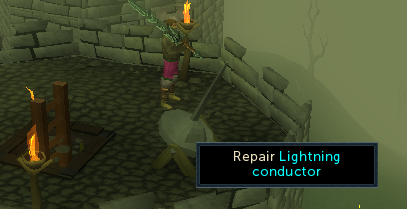 The nearest Furnace is located in Port Phasmatys, but if you don't have any Ectotokens, head over to the one in Al Kharid. Once you have the Conductor, bring it upstairs and go up the southern-most ladder. Use it with the Lightning Conductor to attract the lightning. 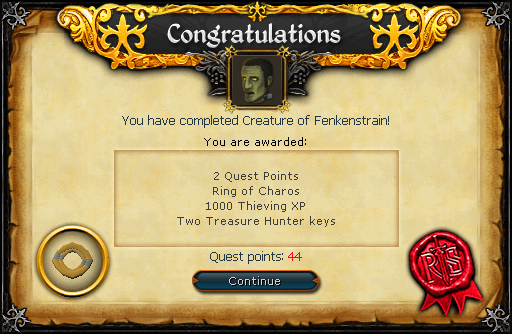 Head back to Dr. Fenkenstrain, who now needs you to kill the monster that he created, and he gives you a Tower Key. Head upstairs, go through the gate in the center of the room and climb the ladder, where you'll find Fenkenstrain's Monster. Talk to him, who wants you to stop Dr. Fenkenstrain's evil work. Now just pickpocket the Doctor to obtain a Ring of Charos and complete the quest.